The eating habits of milk snake species are very similar to the habits of other temperate climate colubrid snakes, including king snakes, with whom they share a genus -- some herpetologists even consider king snakes a type of milk snake -- and the closely-related corn and rat snakes. They're very common in the pet trade and considered easy to feed. Wild milk snakes eat small mammals, birds, amphibians and reptiles -- diet varies with the individual snake's subspecies, geographic area and hunting ability. Pet milk snakes eat pre-killed mice and rats with day-old chicks and baby quail for variety -- they can thrive on a mammal-only diet, but not a bird-only one. They swallow their prey whole. Prey should be bought frozen, thawed in the refrigerator for 24 to 48 hours, warmed in hot water, dried on paper towels and fed immediately. Snakes need food about as wide as the widest part of their body (not their head). Adult snakes generally need one food item for the first three to four feet of length and an additional item per additional foot. Wild snakes eat wherever they've caught food. Pet snakes should eat outside their normal tank to prevent tank aggression. 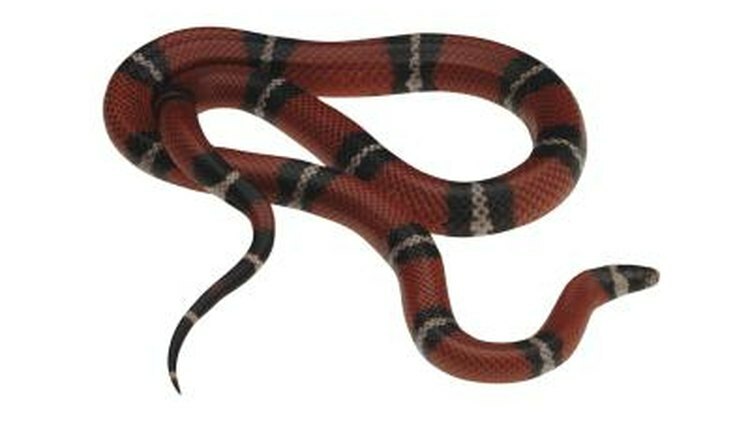 Feed pet milk snakes in a small, bare feeding tank. A 5- to 10-gallon terrarium with newspaper on the floor works well. Don't feed them on decorative substrate, such as bark, because they can ingest it and choke or develop fatal intestinal blockage. They can also feed in a cardboard box or paper grocery bag placed back inside the living quarters for the snake to leave at her leisure. Never handle a snake who's just eaten. Only feed snakes when they're warm enough to be active and interested -- a cold snake usually won't feed and can't digest. Baby milk snakes eat about every five days. This slowly decreases over about two years until adulthood, when they eat every three to six weeks. Most milk snakes eat during daylight, when these species hunt in the wild. Some need a certain level of humidity to eat and digest. You can provide this with a "hide box" of damp moss. Snakes need to be hydrated to swallow and digest their food. Pet snakes must have clean, fresh water at all times, in a dish big enough for the snake to curl up in. Some herpetologists recommend soaking juvenile snakes in lukewarm dechlorinated water for 10 minutes before each feeding to stimulate digestion and ensure hydration. Many snakes won't eat while they're preparing to shed. The primary sign of shedding is milky eye caps. Some snakes hibernate for about three months during the winter. Signs are colder days and a restless snake who won't eat. Some milk snakes won't feed while gravid (carrying eggs). This requires close prior contact with a male of the same species. Snakes also stop eating when ill, in pain, living in poor conditions, stressed or infested with parasites. If your pet snake has refused food for more than six weeks and isn't hibernating, she needs immediate veterinary attention. What Species of Python Are Good Pets?